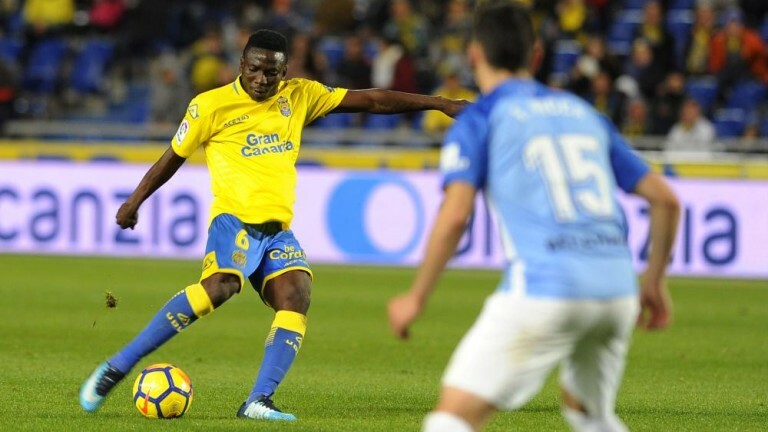 Oghenekaro Peter Etebo (95) is a Nigerian midfielder currently playing for Las Palmas in La Liga. He is on loan from Feirense and his performances make him one of the likely signings in the Top Leagues for the next transfer window. He can play in many different positions of the midfield, centrally or in the wings, and we even saw him performing well as false nine with Feirense. This shows his capability to adapt to many different tactical systems being one of his outstanding atributes. In all of those positions he showed mobility, covering more distance per match, strength and intensity. Therefore, he could be a good signing for a pressing oriented team. Etebo’s energy and stamina makes him a good high pressing player. With a balance between lost balls and recoveries, he often displays good defensive efforts. Half of his recovered balls are located in the opposite half. Even when he was playing at Feirense in attacking roles his defensive numbers were interesting enough. 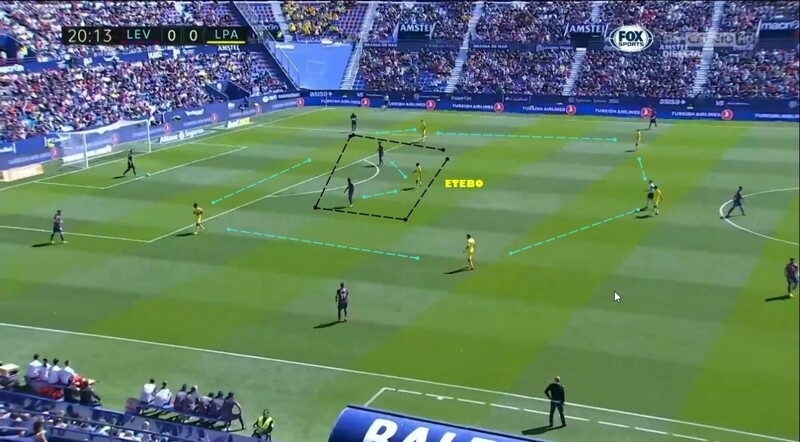 He is not the first option to the build up of Las Palmas but has been used in this role by Paco Jémez (Las Palmas coach). 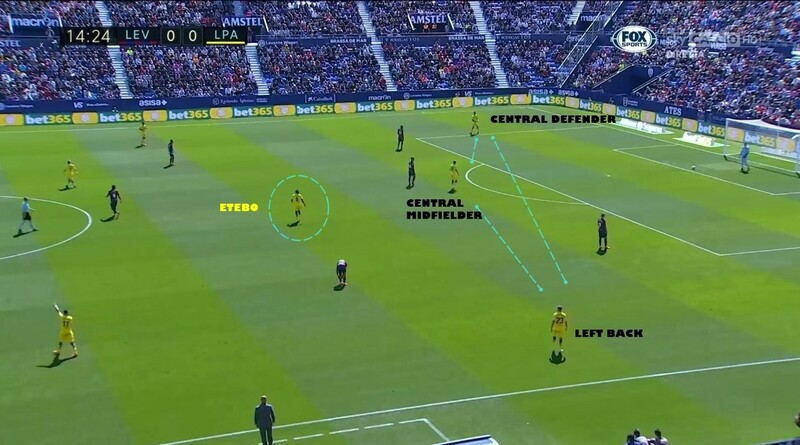 He owns some technical ability for that task but Etebo is not the best player to come near the central defenders and initiate the play. He struggles to place his body correctly in that zone and suffers under the pressing of the rivals. 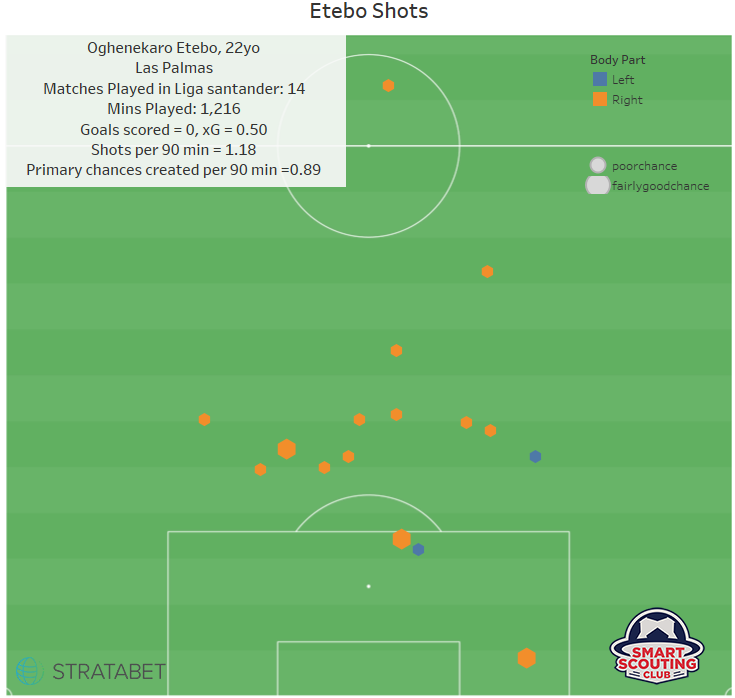 Etebo has been used in deep positions that prevent him for taking advantage of one of his best aims: late runs to the box to surprise defenders. His shots during the second leg of La Liga have been mostly poor chances from outside the box. 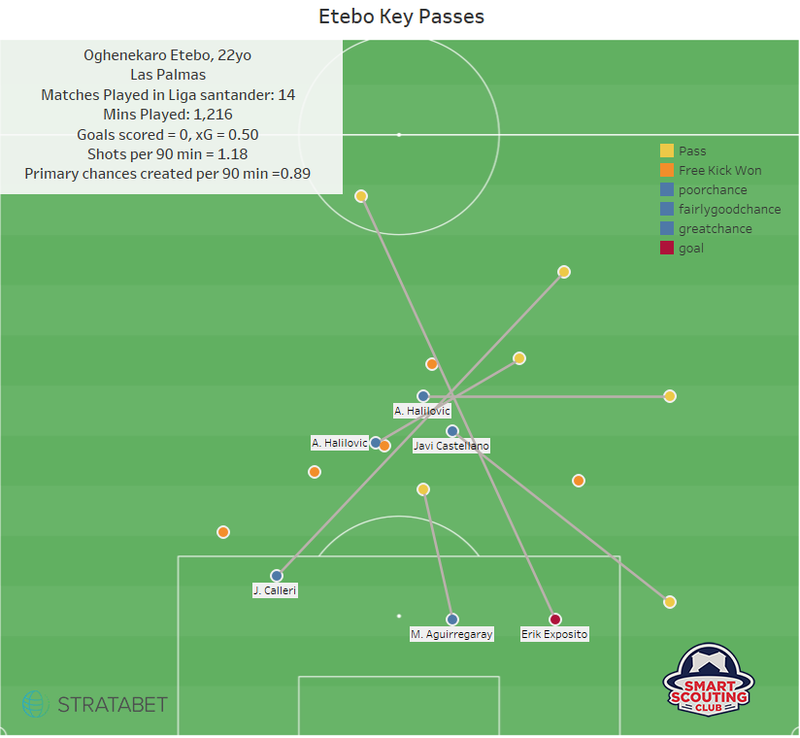 Etebo’s first touch is good enough for midfield and attack and he completes passes with great risk-reward ratio. That makes him a good link up player and also a good addition to the final third of the pitch. Besides, he can carry the ball and is a better than average dribbler from central or wing positions so he is asset for any team in the opposite half. Etebo will be one of the names of the forthcoming market. He has attracted interest from Ligue 1 and Premier League teams and La Liga clubs should also take note of his skills despite the disappointing results of Las Palmas. Some of those teams will use the World Cup to scout him in a different enviroment. At Smart Scouting we think that a midfield central attacking oriented role may be the best suited for the young Nigerian national team player.